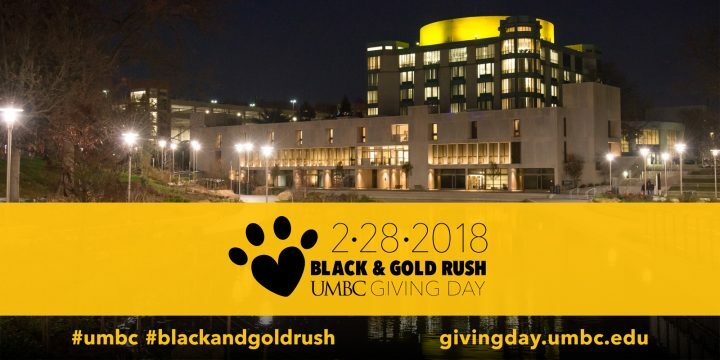 UMBC’s first-ever Black and Gold Rush Giving Day is setting out to have a major impact, raising funds to support UMBC students today and building community connections for the future. Beginning at midnight on Wednesday, February 28, 2018, UMBC will embark on a marathon day of giving. A first for the UMBC campus, the goal of Giving Day is to secure as many donors as possible in a 24-hour period. With an ambitious goal of 350 donors, UMBC is relying on the entirety of Retriever Nation to make it a reality. “Giving Day is an embodiment of what we’re capable of,” says UMBC President Freeman Hrabowski. “UMBC is over 70,000 alumni strong, with thousands of faculty, staff, family members, and friends who are such an important part of our story. We’re calling on this entire Retriever family to join us in celebration on Giving Day, and to show what we can achieve together in support of our students.” President Hrabowski will take over UMBC’s Twitter account in the midst of the excitement on February 28. Thirteen causes have been identified as areas of support for the inaugural Giving Day. Donors are encouraged to choose one or more of these causes to contribute to during the day. One option, the Stay Black and Gold Student Emergency Fund, directly supports students who find themselves in moments of financial stress, who just need a little extra support to complete their degree. This fund embodies the sense of community generosity behind the entire Black and Gold Rush project. “Giving Day represents a wonderful opportunity for the entire UMBC community to show its Black and Gold Pride. By making a gift, thanking someone for their generosity, or sharing stories about the impact that giving has had, everyone can be a part of this exciting event,” says Greg Simmons ’04, vice president of institutional advancement. In honor of Black and Gold Rush, all Retrievers are invited to wear black and gold on February 28. 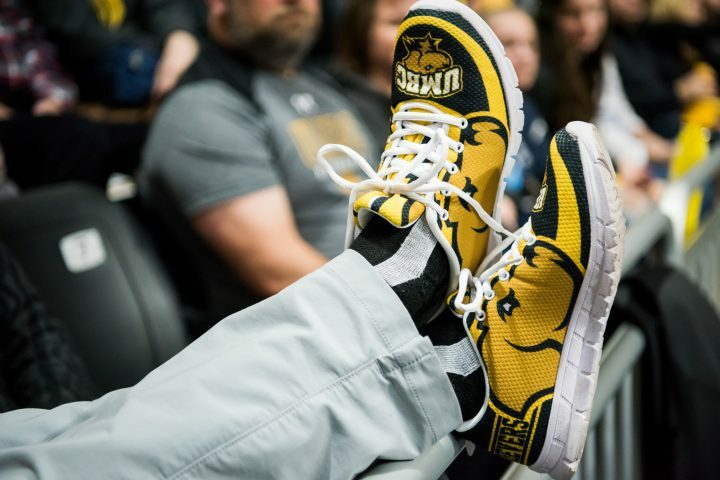 To help support the cause, the UMBC Bookstore will offer 30% off UMBC logo merchandise the day before, on February 27. Join in the celebration of UMBC spirit on February 28 by stopping by Lower Flat Tuesdays, which will serve as Giving Day headquarters. There, UMBC groups Mama’s Boys, The Stilettos, and Major Definition will perform and WMBC will host a live online broadcast, with plenty of giveaways. Adding some extra energy to the festivities will be a competitive Giving Day ambassador challenge. Over the past several weeks, community members have been signing up to serve as social media ambassadors, boosting awareness about Giving Day across Retriever Nation. During Giving Day itself, participants will be able to watch their progress on a leaderboard to see which ambassadors have helped generate the most clicks and donations for their UMBC causes. Prizes will be awarded to the top three finishers. Whether in class or at the office, walking around Hilltop Circle or studying abroad, all members of Retriever Nation can follow Giving Day live on February 28 on UMBC’s Twitter, Facebook, Instagram (@UMBClife), and Snapchat (@UMBClife), and post their own thoughts on why supporting students is such a core UMBC value using #UMBC and #blackandgoldrush.